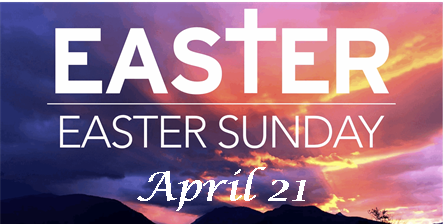 Please join us at Aldersgate on Easter morning at 10:45 a.m. for our morning worship service and be blessed by an Easter message delivered by Bro. Barry and also enjoy beautiful Easter music presented by Aldersgate’s Choir. Aldersgate will offer “Communion for the Community” on Easter Sunday morning at the cross on our front lawn from 9:20 a.m. — 10:20 a.m. We will also have a station available in the corner of the parking lot for those unable to walk through the lawn. Everyone is invited to come, as all are welcome at our communion table.